Find Coronado Motor Hotel deals, discounts and special offers. This hotel features both indoor and outdoor pools, a hot tub and a complimentary airport shuttle. Minutes from the Marine Corps Air Station, this smoke free hotel offers and outdoor swimming pool and hot tub. Minutes from Yuma National Heritage Area, this all suite hotel offers a complimentary breakfast buffet and outdoor pool. Located a mile from the Yuma Airport, this hotel offers a complimentary continental breakfast and The Dunes restaurant. 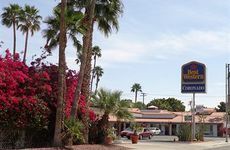 Located just off I-8, this hotel offers a complimentary breakfast and convenient access to historic Yuma. Just two miles from the Yuma Airport, this hotel offers a complimentary breakfast and an on-site restaurant and lounge.